Alma Mater Secondary Education (VI TO X) comprises a stage where a child takes the first steps towards adolescence before adulthood. This is a stage where we give nourishment in the form of our curriculum & programme to our saplings so that they blossom into fruitful trees. Our programme is designed to extend academic skills of students to promote personal development & encourage an attitude of responsible citizenship through a variety of learning experiences. Children are groomed in such a manner that they enjoy their studies as also their independence. Focus is given on both academic content & development of essential skills like critical thinking, intellectual curiosity & leadership skills and the ability to speak & write effectively. Hi-tech classrooms, a well equipped library, Mathematics lab, Science labs, English language lab, etc. 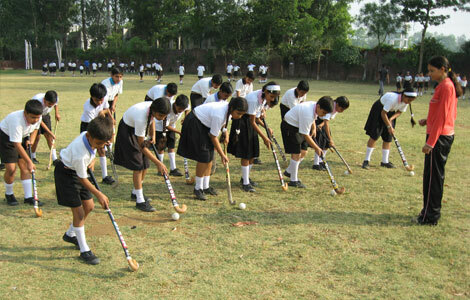 have been developed at Alma Mater to cater to the various needs of the students. We offer education which prepares them for life. There are various physical, co-curricular & vocational activities to nurture their innate talents in games & sports, music, dance, swimming, martial arts, gymnastics, yoga, etc. A perfect balance is made between academics, vocational & co curricular activities, which gives full exposure to the innate skills of students. A Day Boarding Section each has also been developed for classes VI to VIII. This facility is available up to 4 PM. During this span, breakfast & lunch is provided to the students. It also encompasses revision classes, home assignments as also individual attention given by the faculty.